For the district in Saga prefecture, Japan, see Fujitsu, Saga. For the Shizuka Kudo song, see Fu-ji-tsu. Fujitsu Ltd. (富士通株式会社, Fujitsū Kabushikigaisha) is a Japanese multinational information technology equipment and services company headquartered in Tokyo, Japan. In 2015, it was the world's fourth-largest IT services provider measured by IT services revenue (after IBM, HP and Accenture). Fortune named Fujitsu as one of the world's most admired companies and a Global 500 company. ^ a b c d e "FY 2017 Full-Year Financial Results" (PDF). Retrieved April 29, 2017. Fujitsu chiefly makes computing products, but the company and its subsidiaries also offer a diversity of products and services in the areas of personal computing, enterprise computing, including x86, SPARC and mainframe server products, as well as storage products, telecommunications, advanced microelectronics, and air conditioning. It has approximately 140,000 employees and its products and services are available in over 100 countries. Fujitsu is the second oldest IT company after IBM and before Hewlett Packard, established on June 20, 1935, under the name Fuji Telecommunications Equipment Manufacturing (富士電気通信機器製造, Fuji Denki Tsūshin Kiki Seizō), as a spin-off of the Fuji Electric Company, itself a joint venture between the Furukawa Electric Company and the German conglomerate Siemens which had been founded in 1923. Despite its connections to the Furukawa zaibatsu, Fujitsu escaped the Allied occupation of Japan after the Second World War mostly unscathed. In 1954, Fujitsu manufactured Japan's first computer, the FACOM 100 mainframe, and in 1961 launched its second generation computers (transitorized) the FACOM 222 mainframe. The 1968 FACOM230 "5" Series marked the beginning of its third generation computers. Fujitsu offered mainframe computers from 1955 until at least 2002 Fujitsu's computer products have included minicomputers, small business computers, servers and personal computers. In 1955, Fujitsu founded Kawasaki Frontale as a company football club; Kawasaki Frontale has been a J. League football club since 1999. In 1967, the company's name was officially changed to the contraction Fujitsū (富士通). Since 1985, the company also fields a company American football team, the Fujitsu Frontiers, who play in the corporate X-League, have appeared in 7 Japan X Bowls, winning two, and winning two Rice Bowls. In 1971, Fujitsu signed an OEM agreement with the Canadian company Consolidated Computers Limited (CCL) to distribute CCL's data entry product, Key-Edit. Fujitsu joined both ICL who earlier began marketing Key-Edit in the British Commonwealth of countries as well as in both western and eastern Europe; and CCL's direct marketing staff in Canada, USA, London (UK) and Frankfurt. Mers Kutt, inventor of Key-Edit and founder of CCL, was the common thread that led to Fujitsu’s later association with ICL and Gene Amdahl. In 1986, Fujitsu and The Queen's University of Belfast business incubation unit (QUBIS Ltd) established a joint venture called Kainos, a privately held software company based in Belfast, Northern Ireland. 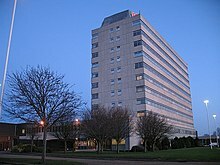 In 1990, Fujitsu acquired 80% of the UK-based computer company International Computers Limited (ICL) for $1.29 billion (ICL was renamed Fujitsu Services in 2002). In September 1990, Fujitsu announced the launch of a new series of mainframe computers which were at that time the fastest in the world. In July 1991, Fujitsu acquired more than half of the Russian company KME-CS (Kazan Manufacturing Enterprise of Computer Systems). In 1992, Fujitsu introduced the world's first 21-inch full-color plasma display. It was a hybrid, based upon the plasma display created at the University of Illinois at Urbana-Champaign and NHK STRL, achieving superior brightness. In April 1997, the company acquired a 30 percent stake in GLOVIA International, Inc., an El Segundo, Calif., manufacturing ERP software provider whose software it had begun integrating into its electronics plants starting in 1994. In June 1999 Fujitsu's historical connection with Siemens was revived, when the two companies agreed to merge their European computer operations into a new 50:50 joint venture called Fujitsu Siemens Computers, which became the world's fifth-largest computer manufacturing company. In April 2000, Fujitsu acquired the remaining 70% of GLOVIA International. In April 2002 ICL re-branded itself as Fujitsu. On March 2, 2004, Fujitsu Computer Products of America lost a class action lawsuit over hard disk drives with defective chips and firmware. In October 2004, Fujitsu acquired the Australian subsidiary of Atos Origin, a systems implementation company with around 140 employees which specialized in SAP. In October 2007, Fujitsu's Australia and New Zealand subsidiary acquired Infinity Solutions Ltd, a New Zealand-based IT hardware, services and consultancy company, for an undisclosed amount. In March 2009, Fujitsu announced that it had decided to convert FDK Corporation, at that time an equity-method affiliate, to a consolidated subsidiary from May 1, 2009 (tentative schedule) by subscribing to a private placement to increase FDK's capital. On April 1, 2009, Fujitsu agreed to acquire Siemens' stake in Fujitsu Siemens Computers for approximately EUR450m. Fujitsu Siemens Computers was subsequently renamed Fujitsu Technology Solutions. Concerning of Net loss forecast amounted 95 billion yen in the year ending March 2013, in February 2013 Fujitsu announced to cut 5,000 jobs which 3,000 jobs in Japan and the rest overseas from its 170,000 employees. Fujitsu will also merge its Large Scale Integrated chip business with that of Panasonic Corporation. In 2015, Fujitsu Celebrates 80 years since establishment and on the IT side are currently embarked upon the Fujitsu 2015 World Tour which has included 15 major cities globally and been visited by over 10,000 IT professionals with Fujitsu presenting its take on the future of Hyper Connectivity and Human Centric Computing. In April 2015 GLOVIA International is renamed FUJITSU GLOVIA, Inc. In November 2015, Fujitsu Limited and VMware announced new areas of collaboration to empower customers with flexible and secure cloud technologies. It also acquired USharesoft which provides enterprise-class application delivery software for automating the build, migration and governance of applications in multi-cloud environments. In January 2016, Fujitsu Network Communications Inc. announced a new suite of layered products to advance software-defined networking (SDN) for carriers, service providers and cloud builders. Virtuora NC, based on open standards, is described by Fujitsu as "a suite of standards-based, multi-layered, multi-vendor network automation and virtualization products" that "has been hands-on hardened by some of the largest global service providers." Fujitsu Laboratories, Fujitsu's Research and Development division, has 1,300 employees and a capital of 5 Billion Yen. It is run by Tatsuo Tomita. In 2012, Fujitsu announced that it had developed new technology for non-3D camera phones. The technology will allow the camera phones to take 3D photos. Fujitsu Consulting is the consulting and services arm of the Fujitsu group, providing information technology consulting, implementation and management services. Fujitsu Consulting was founded in 1973 in Montreal, Quebec, Canada, under its original name "DMR" (an acronym of the three founder's names: Pierre Ducros, Serge Meilleur and Alain Roy) During the next decade, the company established a presence throughout Quebec and Canada, before extending its reach to international markets. For nearly thirty years, DMR Consulting grew to become an international consulting firm, changing its name to Fujitsu Consulting in 2002 after being acquired by Fujitsu Ltd.
Fujitsu operates a division of the company in India, resulting from an acquisition of North America-based company, Rapidigm. It has offshore divisions at Noida, Pune, Hyderabad, Chennai and Bangalore with Pune being the head office. Fujitsu Consulting India launched its second $10 million development center at Noida in October 2007, a year after starting operation in the country. Following the expansion plan, Fujitsu Consulting India launched the fourth development center in Bengaluru In Nov 2011. Fujitsu Ltd. has a 42% shareholding in Fujitsu General, which manufactures and markets various air conditioning units and humidity control solutions under the General & Fujitsu brands. In India, Fujitsu General has a joint venture with ETA-Ascon which manufactures and sells air conditioners under the General brand. PFU Limited, headquartered in Ishikawa, Japan is a wholly owned subsidiary of Fujitsu Limited. PFU Limited was established in 1960, has approximately 4,600 employees globally and in 2013 turned over 126.4 billion Yen ($1.2 Billion USD). PFU manufactures interactive kiosks, keyboards, network security hardware, embedded computers and imaging products (document scanners) all under the PFU or Fujitsu brand. In addition to hardware PFU also produce desktop and enterprise document capture software and document management software products. PFU has overseas Sales & Marketing offices in Germany (PFU Imaging Solutions Europe Limited), Italy (PFU Imaging Solutions Europe Limited), United Kingdom (PFU Imaging Solutions Europe Limited)and United States of America ( Fujitsu Computer Products of America Inc). PFU Limited are responsible for the design, development, manufacture, sales and support of document scanners which are sold under the Fujitsu brand. Fujitsu are market leaders in professional document scanners with their best selling fi-series, Scansnap and ScanPartner product families as well as Paperstream IP, Paperstream Capture, Scansnap Manager, Cardminder, Magic Desktop and Rack2Filer software products. Fujitsu Glovia, a wholly owned subsidiary of Fujitsu Ltd., is a discrete manufacturing enterprise resource planning software vendor based in El Segundo, California, with international operations in the Netherlands, Japan and the United Kingdom. The company offers on-premise and cloud-based ERP manufacturing software under the Glovia G2 brand, and software as a service (SaaS) under the brand Glovia OM. The company was established in 1970 as Xerox Computer Services, where it developed inventory, manufacturing and financial applications. Fujitsu acquired 30 percent of the renamed Glovia International in 1997 and the remaining 70 percent stake in 2000. Fujitsu Client Computing Limited (FCCL), headquartered in Kawasaki, Kanagawa, the city where the company was founded, is the division of Fujitsu responsible for research, development, design, manufacturing and sales of consumer PC products. Formerly a wholly owned subsidiary, in November 2017, FCCL was spun off into a joint venture with Lenovo and Development Bank of Japan (DBJ). The new company retains the same name, and Fujitsu is still responsible for sales and support of the products; however, Lenovo owns a majority stake at 51%, while Fujitsu retains 44%. The remaining 5% stake is held byd DBJ. 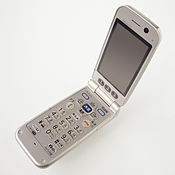 An NTT DoCoMo F-10A mobile phone produced by Fujitsu. In May 2011, Fujitsu decided to enter the mobile phone space again, Microsoft announcing plans that Fujitsu would release Windows Phone devices. Fujitsu PRIMERGY and ETERNUS are distributed by TriTech Distribution Limited in Hong Kong. LIFEBOOK, AMILO: Fujitsu's range of notebook computers and tablet PCs. Fujitsu offers a public cloud service delivered from data centers in Japan, Australia, Singapore, the United States, the United Kingdom and Germany based on its Global Cloud Platform strategy announced in 2010. The platform delivers Infrastructure-as-a-Service (IaaS) – virtual information and communication technology (ICT) infrastructure, such as servers and storage functionality – from Fujitsu's data centers. In Japan, the service was offered as the On-Demand Virtual System Service (OViSS) and was then launched globally as Fujitsu Global Cloud Platform/S5 (FGCP/S5). Since July 2013 the service has been called IaaS Trusted Public S5. Globally, the service is operated from Fujitsu data centers located in Australia, Singapore, the United States, the United Kingdom, Germany and Japan. Fujitsu has also launched a Windows Azure powered Global Cloud Platform in a partnership with Microsoft. This offering, delivering Platform-as-a-Service (PaaS), was known as FGCP/A5 in Japan but has since been renamed FUJITSU Cloud PaaS A5 for Windows Azure. It is operated from a Fujitsu data center in Japan. It offers a set of application development frameworks, such as Microsoft .NET, Java and PHP, and data storage capabilities consistent with the Windows Azure platform provided by Microsoft. The basic service consists of compute, storage, Microsoft SQL Azure, and Windows Azure AppFabric technologies such as Service Bus and Access Control Service, with options for inter-operating services covering implementation and migration of applications, system building, systems operation, and support. Fujitsu acquired RunMyProcess in April 2013, a Cloud-based integration Platform-as-a-Service (PaaS) specialized in workflow automation and business application development. Fujitsu has launched their Cloud Service K5 offering with Availability Zones currently deployed in Japan and the UK, further deployments are progressing across Europe. Cloud Service K5 is based on open-standard technologies and can be consumed as a Public Cloud, Virtual Private Cloud or a Private Cloud. Fujitsu offers local cloud platforms, such as in Australia, that provide the ability to rely on its domestic data centers which keep sensitive financial data under local jurisdiction and compliance standards. Fujitsu produces the SPARC-compliant CPU (SPARClite), the "Venus" 128 GFLOP SPARC64 VIIIfx model is included in the K computer, the world's fastest supercomputer in June 2011 with a rating of over 8 petaflops, and in November 2011, K became the first computer to top 10 petaflops in September 2011. The Fujitsu FR, FR-V and ARM architecture microprocessors are widely used, additionally in ASICs and Application-specific standard products (ASSP) like the Milbeaut with customer variants named Nikon Expeed. They were acquired by Spansion in 2013. The old slogan "The possibilities are infinite" can be found below the company's logo on major advertisements and ties in with the small logo above the letters J and I of the word Fujitsu. This smaller logo represents the symbol for infinity. As of April 2010, Fujitsu is in the process of rolling out a new slogan focused on entering into partnerships with its customers and retiring the "possibilities are infinite" tagline. The new slogan is "shaping tomorrow with you". Fujitsu reports that all its notebook and tablet PCs released globally comply with the latest Energy Star standard. Greenpeace's Cool IT Leaderboard of February 2012 "evaluates global IT companies on their leadership in the fight to stop climate change" and ranks Fujitsu 3rd out of 21 leading manufacturers, on the strength of "well-developed case study data of its solutions with transparent methodology" and "[standing] out in the Leaderboard for scoring high in the Future Savings Goal criterion." ^ NihonSekkei.co.jp Archived May 28, 2009, at the Wayback Machine, Shiodome City Center Nihon Sekkei. Retrieved on May 19, 2009. ^ a b c "Fujitsu at a Glance". Retrieved April 29, 2016. ^ "Japan All Contacts." Fujitsu. Retrieved on May 19, 2009. ^ "The 2015 HfS Global IT Services Top Ten". HfS Research 2015. October 7, 2015. Retrieved April 29, 2016. ^ "World's most admired companies". Retrieved April 29, 2016. ^ "Fortune Global 500". Retrieved May 12, 2016. ^ "History of Fujitsu - Fujitsu Global". www.fujitsu.com. ^ "Mainframe Computers". Fujitsu. Retrieved April 2, 2009. ^ "Minicomputers". Fujitsu. Retrieved April 2, 2019. ^ "Small Business Computers". Fujitsu. Retrieved April 2, 2019. ^ "Servers/Workstations". Fujitsu. Retrieved April 2, 2019. ^ "Personal Computers". Fujitsu. Retrieved April 2, 2019. ^ "フロンティアーズ : 富士通". sports.jp.fujitsu.com. ^ "History of Fujitsu spin out company". Retrieved June 15, 2013. ^ "Fujitsu joint venture with QUBIS". 1996–2002. Retrieved June 15, 2013. ^ Prokesch, Steven (July 31, 1990). "Fujitsu To Buy ICL Stake". The New York Times. Retrieved November 18, 2011. ^ "Fujitsu: Innovation is a constant for 75 years". Computer Weekly. July 2010. Retrieved November 18, 2011. ^ Sanger, David E. (September 5, 1990). "Fujitsu Announces Mainframe". The New York Times. Retrieved December 14, 2011. ^ "Fujitsu claims fastest computer". Pittsburgh Post-Gazette. September 5, 1990. Retrieved December 14, 2011. ^ By Alun Williams, PC Pro. “Spansion – AMD and Fujitsu brand their Flash memory Archived March 16, 2012, at the Wayback Machine.” July 13, 2003. ^ Fisher, Lawrence M. (July 31, 1997). "Fujitsu to Pay $850 Million To Acquire Rest of Amdahl". The New York Times. Retrieved December 17, 2011. ^ a b c "Connectory.com Network". ^ Harrison, Michael (June 18, 1999). "Fujistu in European venture". The Independent. London. Retrieved November 18, 2011. ^ O'Neill, Rob (26 October 2004). "Jobs 'safe' in Atos takeover". Melbourne: The Age. Retrieved 29 June 2012. ^ a b White, Dominic (August 16, 2007). "Reuters in £500m deal with Fujitsu". London: The Telegraph. Retrieved December 15, 2011. ^ a b "Reuters Outsourcing Global IT Ops to Fujitsu". ABC News. August 17, 2007. Retrieved December 15, 2011. ^ "Fujitsu sets up $10-m centre in Noida". The Hindu. October 9, 2007. Retrieved December 15, 2011. ^ "Fujitsu to increase India headcount to 2,500". The Financial Express. October 8, 2007. Retrieved December 15, 2011. ^ "Fujitsu to acquire Infinity". Computerworld. September 28, 2007. Archived from the original on May 25, 2012. Retrieved December 17, 2011. ^ "Fujitsu buys Infinity for services clout". Reseller. October 5, 2007. Archived from the original on April 22, 2012. Retrieved December 17, 2011. ^ "Toshiba and Fujitsu reach HDD deal: Nikkei" (Press release). Reuters. January 14, 2009. Retrieved January 14, 2009. ^ "Toshiba Agrees to Acquire Fujitsu's Hard Drive Business" (Press release). Xbitlabs. February 17, 2009. Archived from the original on February 19, 2009. Retrieved February 17, 2009. ^ Toshiba takes over Fujitsu's HDD business. IT PRO (2009-10-02). Retrieved on 2013-07-26. ^ "Notice Regarding Conversion of FDK into Consolidated Subsidiary - Fujitsu Global". www.fujitsu.com. ^ "Fujitsu to Acquire Siemens's Stake in Fujitsu Siemens Computers" (Press release). Fujitsu. December 4, 2008. ^ "Fujitsu: Fujitsu Technology Solutions will drive transformation for Fujitsu". ts.fujitsu.com. ^ "Fujitsu Advances on Job Cuts, Chip Reorganization". Bloomberg. February 8, 2013. ^ "Fujitsu, Panasonic Secure Funding for Chip Merger". WJD. April 24, 2014. ^ "Account of Fujitsu World Tour London 2015". Onega. July 1, 2015. ^ Yahoo! Finance. “Fujitsu and VMware Expand Global Collaboration in the Cloud.” November 9, 2015. November 17, 2015. ^ "Fujitsu Acquires UShareSoft to Bolster its Cloud Business - Fujitsu Global". www.fujitsu.com. Fujitsu Limited. Retrieved 23 April 2018. ^ "linrx by Fujitsu Global". Fujitsu Global. Retrieved 23 April 2018. ^ David Ramel, Virtualization Review. “Fujitsu Unveils Suite for Software-Defined Networking.” Jan 7, 2016. Jan 8, 2016. ^ About Fujitsu Laboratories : FUJITSU LABORATORIES. Jp.fujitsu.com. Retrieved on 2013-07-26. ^ "Fujitsu Develops 3D Picture Technology for Non-3D Camera Phones". BrightWire. Archived from the original on July 22, 2012. ^ "Pierre Ducros: Business Man and Mentor" (PDF). ^ "Fujitsu – History". Retrieved January 14, 2010. ^ "Fujitsu Consulting India launches $10 million facility in Noida". EFYTimes.com. October 2007. ^ "Fujitsu to opens new development center in Bangalore". The Hindu. November 19, 2011. ^ "Fujitsu General website (Japanese)". Retrieved October 31, 2011. ^ "Fujitsu, Lenovo and DBJ form PC Joint Venture". fujitsu.com. Fujitsu. Retrieved 16 October 2018. ^ "Fujitsu Distributor In HK | Fujitsu Hong Kong". www.ttdist.com. Retrieved 2016-02-05. ^ Ostergaard, Bernt (April 23, 2010). "Fujitsu's Global Cloud Strategy Envisions New Business Models". Current Analysis. Archived from the original on May 7, 2011. ^ "Fujitsu Declares Comprehensive, Global, Trusted Cloud Strategy". JCN Newswire. 2013-07-11. ^ Prickett Morgan, Timothy (July 29, 2011). "Fujitsu fluffs COBOL, Java on Azure clouds". The Register. ^ "Fujitsu Enables More Effective Use of Cloud with Enhanced Hybrid Cloud Initiatives" (Press release). Tokyo, Japan. 2013-11-20. ^ "Fujitsu launches Cloud Services Portal for Locally Built Australian Cloud Environment" (Press release). Fujitsu. October 7, 2010. Retrieved October 11, 2011. ^ "Multi Core Processor SPARC64™ Series - Fujitsu Global". www.fujitsu.com. ^ "Japan Reclaims Top Ranking on Latest TOP500 List of World’s Supercomputers" Archived June 23, 2011, at the Wayback Machine. TOP500. Retrieved June 20, 2011. ^ "K computer" Achieves Goal of 10 Petaflops". Fujitsu.com, November 2, 2011. Retrieved November 10, 2011. ^ "GIC – Service&Support/International Support". Fujitsu. Archived from the original on January 15, 2011. Retrieved August 12, 2010. ^ "Cool IT Leaderboard – Greenpeace International". Greenpeace International. Retrieved March 30, 2012. Wikimedia Commons has media related to Fujitsu-Siemens.